Heavy traffic site. Automatic Data collection, aggregation and transformation. Automatic image generation (informers). Statistics counters. Created using PHP and mySQL technologies on Linux platform. 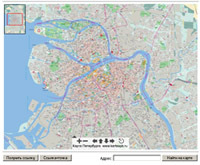 Detailed interactive scalable map with address search. Weather forecasts for more than 10000 points of the world. Automatically calculated forecasts for next 360 hours (15 days) based on National Oceanic and Atmospheric Administration (NOAA) Global Forecasts System Data. Recalculates every 6 hours. Automatic Data collection, aggregation and transformation. Automatic image generation (informers). Created using PHP and mySQL technologies on Linux platform.